Like most sixteen-year-old girls, Cassie O'Connell wonders what it's like to be in love. For Cassie, that question is even more daunting as ten years ago a virus wiped out every male on the planet. Well, almost every male. Cassie discovers two teenage boys, one who has been locked away in a secret isolation chamber. The other boy is immune to the virus. He seeks revenge against the psychotic "man" who is responsible for the murder of his mother and sister. Will the boy's thirst for vengeance endanger Cassie's life as well as his own? As she struggles with her feelings for both boys, Cassie is propelled towards a destiny that will change the world forever. This book has such an interesting premise! I mean think about it what would we as in we women do if men were wiped off the planet??!! I know some would jump for joy HA! But really think about it, what would happen? 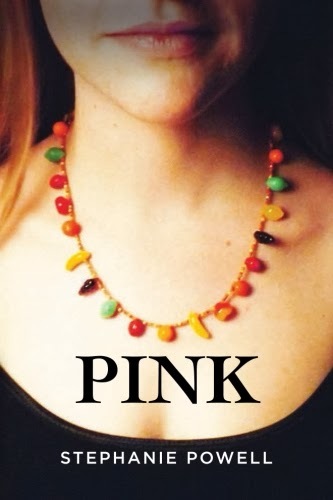 Stephanie Powell takes this idea and runs with it in her debut novel Pink. Cassie has lived in this new world since she was six years old. She lost her twin brother and her father to the virus that wiped the entire world of males. With others around her pairing up and turning for ones they love Cassie isn't sure where she fits in. She wants what her parents had, but with no end insight for the incurable disease she just avoids the whole idea of dating. With her mom trying to find a cure Cassie believes that maybe one day it might happen. I really thought I knew where this book was heading but boy was I wrong! Two major things happen and are revealed and well when this happens the book truly comes alive and had me hooked! Like I said the idea is really interesting, but when you add in all the extras that the author chose it really made this book so much fun! I kept waiting because I knew something was going to happen and then BAM it does and I was left with a WTH face! I really enjoyed Cassie's voice. She isn't perfect but she tried to do the best she could with the knowledge she had at the time. My heart honestly broke for her during one scene and I felt devastated for her. I never saw that particular twist happening and I just wanted to shield her from the pain. That being said though I do wish she would have let more of her emotions show at certain times. There is a big bomb dropped close to the beginning and I felt like it was kinda skimmed over. Often times when big things would happen Cassie would just sorta be there, she would get angry but not angry enough for me to believe that she felt anything. I wanted more emotion. This will be a series and I am very excited by that. I have a lot of questions that weren't answered in this first installment, but I have hope that they will be answered in the coming books. One I really want to know is why Sam, what made him THE puzzle piece?? My other questions deal with all the hows and whys of the conclusion. I don't know if I fully understand everything that was explained but I am more than willing to continue on with this series to find out more. Make sure to check back soon for an exclusive interview with Stephanie!! Great review! So glad to hear your thoughts on the book. I, too, am looking forward to the next installment of the story :)!